I love the poems of Robert Frost...and so I had to buy Lisa Strahl's stamp set "Motivational Centers" from Cornish Heritage Farms. This week's CAS challenge on SCS was to make a greeting the focal point of your card. 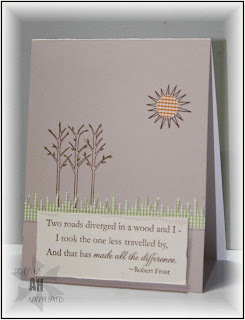 I used part of Robert Frost's "The road not taken" as my focal point. I plan on posting a series of One Layer Cards later on so stay tuned!